Cherie at Shrimpton Couture has been doing some interesting things lately (including adding some reworked vintage and jewelry) but what caught my eye and didn't let go on a recent browse through her site was this dress. There are lots of vintage dresses I love but couldn't imagine ever wearing (or making) myself, but this one looks as if it could have come right off my sewing machine. Or rather, right off my sewing machine if I had the patience to sew underarm gussets in silk, which I've only done once (which is how I know I don't have the patience for it). If only it were my size … or I were its size. Hmmph. I'll just have to keep an eye out for this fabric. If they made it once it must exist somewhere, right? Or I could put it on my ever-expanding Spoonflower list … I'd rather have it in cotton, anyway. With pockets. Click on either image to check it out at Shrimpton Couture, and while you're there you should have a look around … she has pretty, pretty stuff! Oh! I love it. So glad its not my size. Love the print and colors; love the style. My vote is still out on whether or not I like the two together. That is a delight. I wish it had a belt or sash, though (designed to go with it, not faked and tacked on later) to cover the seam at the waist. I just love the placement of the pleats on the skirt! Gives it such a lovely shape. I would just be able to squeeze myself into it with major Spanx help, but sadly, it is out of my price range. 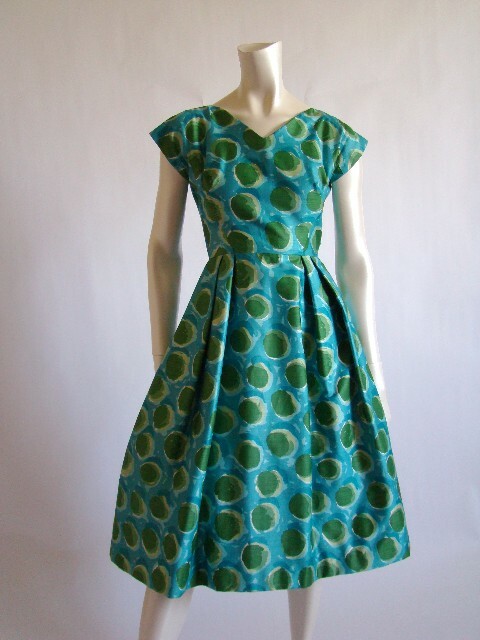 Its what is heartbreaking about lovely vintage dresses in silk…always very dear! I am in love with this dress. 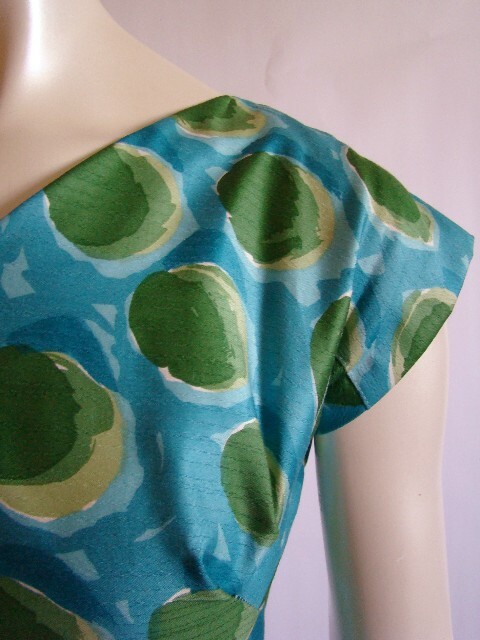 Aw, a pretty aqua dress AND a mention? Thanks so much, Erin! This is absolutely gorgeous.. Im glad you came upon it! Well.. kinda. Im trying really hard not to spend all my money, but this dress is so tempting!